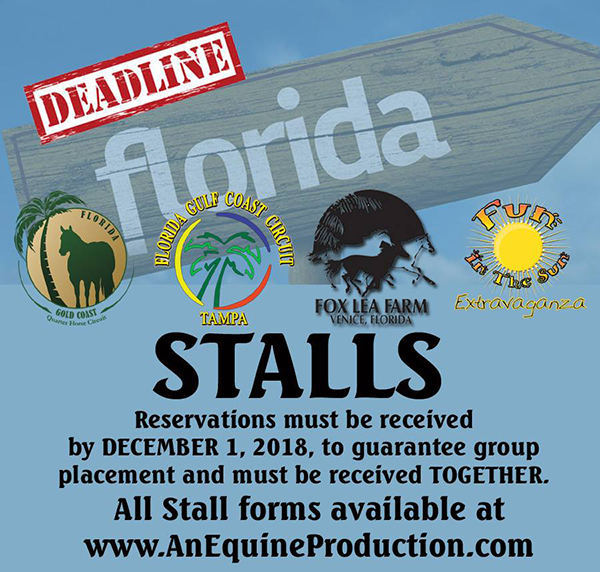 Stalls reservations for the Florida Gold Coast, Florida Gulf Coast, and Fox Lea Farms Winter Circuit are due December 1st, 2018. Reservations must be received by December 1st to guarantee group placement and must be received together. 2018 Florida Gold Coast Stall Form. 2019 Florida Gulf Coast Stall Form. 2019 Fox Lea Farm Winter Circuit Stall Form. All other forms are available on AnEquineProduction.com.